Well, well, would you look at that fun quilt top! 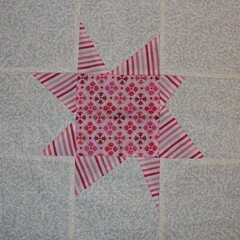 Above is the very first Stars For Linus top, made from your donations, to be quilted this week and donated to The Linus Connection, which in turn will distribute it to a child in crisis in Central Texas. And boy, has Central Texas been in crisis recently. Drought. The hottest summer on record for any state in the U.S. Ever. Fires that have left thousands of people scrambling to find a new home. Isn’t that a good reason to make happy quilts? This second Stars for Linus top went together absolutely beautifully, and I still have another stack of blocks that’s just a few shy of having enough for another top! Because The Linus Connection is such an important part of my life, I will continue to collect Stars for Linus indefinitely. Use them for my organization, or your own favorite blanket charity! Get your friends together for a sewing day and bring the pattern along to share! 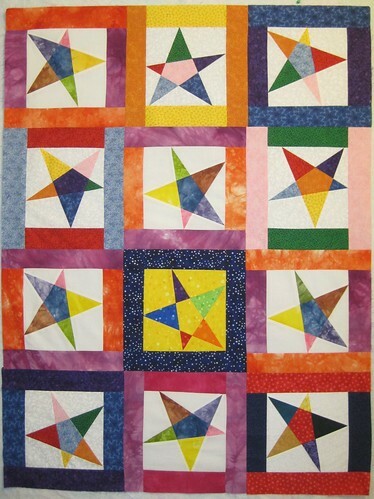 It only takes 12 stars to make a comfort quilt for a child. 20 blocks will make a wonderful teen-sized quilt. 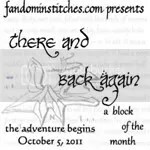 So, you’re not a paper piecer, but you’d still like to contribute? Inspired by WIP Girl, Kristel, known as Clumsy Chord on Talk To Me Tuesday, I will also accept 12″ (12 1/2″ unfinished) Maverick Stars or Wonky Stars (the same technique, different tutorials). To make a 12 1/2″ Maverick or Wonky star, your nine patch units need to be 4 1/2″. 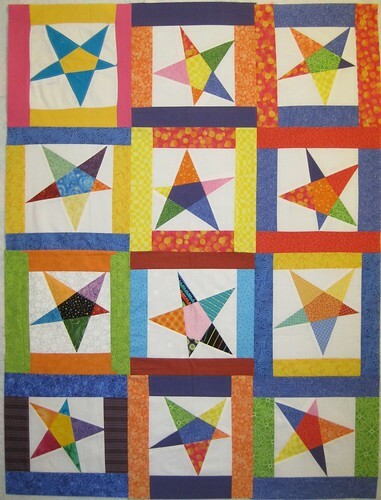 See the video with Kristel’s Wonky Star quilt for Linus. Check out the updated list of Stars for Linus contributors in this post! Sew Something in Leander is hosting their first ever Linus Work Day tomorrow, October 8, from 10-1. I will be there, taking photos and helping in any way I can. I hope to see you there! Add your Sewhooked-related photos to my flickr group and you might be featured in a future post! This entry was posted in charity, Free Patterns, hand crafts, paper piecing, quilting, sewing, The Linus Connection and tagged blanket charityc, central texas fires, charity, free pattern, non-profit, sew something, stars for linus, The Linus Connection on October 7, 2011 by Jennifer Ofenstein.